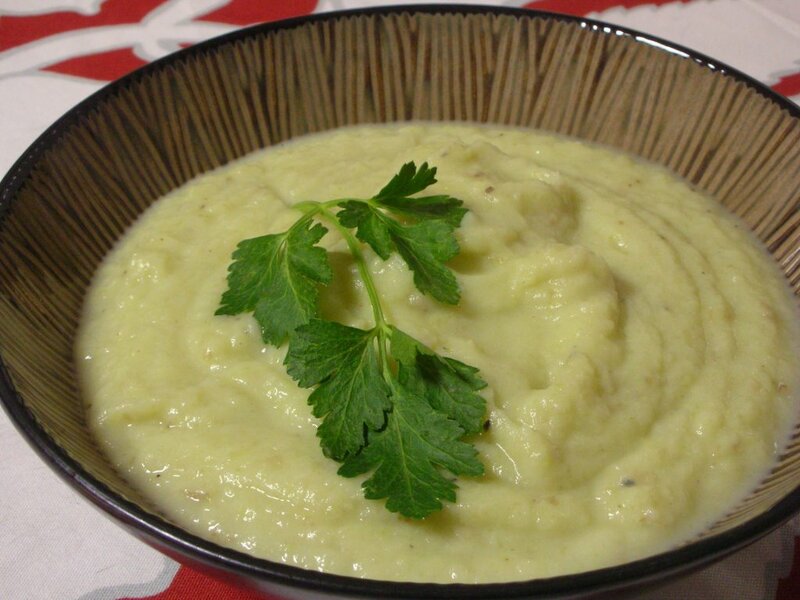 Yes, another puree. I am so loooooving the taste of mashed potatoes and the virtue of potatoes mashed with something lower in calories and carbs. This one is fennel and celery cooked and mashed with potato, then gussied up with a spash of an anise liqueur (Sambuca or Pernod) and cream (or tonight, fat-free half 'n' half). NUTRITION NOTES Weight Watchers: With no added butter, this clocks in at just 1 point. Carb Counters: With 14 grams of net carbs, it is lower carb but not, I'm afraid, low carb. NEXT TIME I'll use a tad less liquid for a thicker consistency. This could have been fixed by a return trip to the stove but the meat was ready, it was time to eat! I'll also again leave out the butter; it just wasn't needed for flavor or even texture. Start the water to a boil. Add the vegetables as they're prepped -- there's no need to wait til the water boils -- and bring to a boil. Cook til vegetables are cooked. Drain and transfer to a food processor (the celery and fennel were both too much for a hand mixer). Add the chicken stock and puree until smooth. Add the remaining ingredients. Serve and enjoy! I baked some fennel last week in a CASSAROLE. I dipped the pieces in ReddiEgg by Nulaid (similar to Eggbeaters but with *much* healthier ingredients), dredged them in seasoned Contadina breadcrumbs, put in a single-layer in a Pam-sprayed glass cassarole dish, and baked until my entree was ready, I guess about 30 min. @350. My dinner guests had never eaten fennel before, and they all liked it!